(AINA) -- National and international rights groups have consistently criticized the recourse to the so-called "reconciliation meetings" -- dubbed "Bedouin sittings" -- that take place between Copts and Muslim assailant after every attack on Copts. The meetings are conducted under the auspices of state security. Last week a series of meetings were held by radical Muslims to decide on the fate of the Copts in a village in Alexandria, and Muslims insisted that the whole Coptic population of 62 families must be deported because of an unsubstantiated accusation levied against one Coptic man. 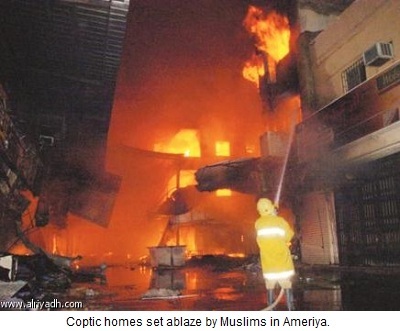 Copts in the village of Kobry-el-Sharbat (El-Ameriya), Alexandria, were attacked on January 27 by a mob of 3000 Muslims led by Salafi leaders, who looted and torched homes and shops belonging to Copts. The violence was prompted by allegations made by a Muslim barber named Toemah that a 34-year-old Coptic tailor, Mourad Samy Guirgis, had on his mobile phone illicit photos of a Muslim woman. Mourad denied the accusation and surrendered to the police for fear for his life. Muslims looted and torched his workshop and home after he surrendered to the police, and his entire family, including his parents and his married brother Romany, were evicted from the village. He is still in police detention. (AINA 1-28-2012). 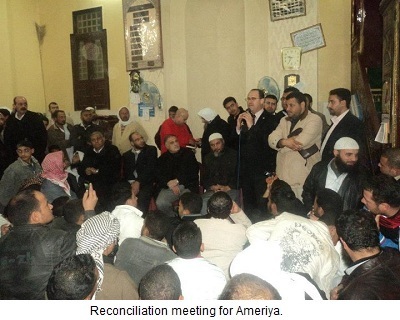 Three "reconciliation meetings" were held at the El-Ameriya village police headquarters. They were attended by Salafi and Muslim Brotherhood representatives from neighboring villages, as well as church representative. Muslims demanded the eviction of all Coptic inhabitants from the village because "Muslim honour had been damaged." Many believe that the mobile phone story was fabricated as an excuse to start violence against the Copts. According to the police, the woman in question denied the story and no photos were found on Mourad's mobile phone, according to Ihab Aziz, a Coptic-American activist who is presently in Egypt. During the first reconciliation meeting it was agreed that only Copts who were directly involved with the Mourad incident would be evicted, and the church demanded compensation of two million pounds for the innocent Copts whose homes and businesses were torched on January 27. Muslims, especially Salafis from the neighboring villages, refused any kind of compensation and insisted on the eviction of all Copts. On January 30 a Muslim mob attacked Copts in Kobry-el-Sharbat for the second time, and torched three Coptic homes in the presence of the security forces, "which took the role of an onlooker and made no effort to stop the violence," according to Joseph Malak, lawyer for the Coptic church in Alexandria. "This proves that the assailants were not afraid of the security forces or the law." Muslim representatives demanded the eviction of the wealthy Coptic merchant Abeskhayroun Soliman, together with his four married sons and their families, accusing them of causing sedition by shooting in the air when Muslims broke into and torched their home while the family was inside. "No one was wounded due to the alleged shootings, which the family says never took place. The police authorities issued an arrest warrant for two of the Soliman sons," said Ihab Aziz. The Solimans have been in hiding with a Muslim family which saved them from their burning homes, and is presently giving them protection. Muslims threatened that if eight Coptic families were not evicted by February 3rd, all remaining 54 Coptic families in the village would be subjected to violence after Friday prayers. They called it "Friday of Eviction" and "Friday of Clean-up." On Wednesday February 1, a hastily organized reconciliation meeting was arranged by security authorities, and was attended by Ebeskharion Soliman and one of his sons. eviction of eight Coptic families, namely three of the Mourad families, in addition to five Soliman families. selling of the assets of the wealthy Abeskhayron Soliman family within three months by a committee, under the supervision of Salafi shaikh Sherif el Hawary. Soliman has no right to get involved in the sale or even accompany a prospective buyer. the Committee is to collect any money accrued from the sale of his land, properties, businesses as well as collect promissory notes pending from business transactions by the Soliman-owned chain of stores. in case of non-implementation of this Agreement, all Copts in the Kobry-el-Sharbat village will be attacked, their homes and property completely torched. Abeskhayron Soliman signed the agreement, which most Copts viewed as "humiliating." Father Boktor, who attended the meeting, described the reconciliation agreement as "utter injustice." Wissa Fawzi, member of the Maspero Coptic Youth Union in Alexandria, said that Soliman has nothing at all to do with the Mourad story, but signed the agreement to save his family and the Copts in the village, "otherwise there would have been a massacre of the Copts on that Friday." He said that Security authorities pressured Soliman into accepting the terms of the agreement by threatening him with refusal of police protection for him and his family. "What constitutes the real crisis is the complicity of security officials in the process of displacement," said Fawzi. Copts in Kobry-el-Sharbat were stunned after hearing the news of the eviction of the "top Copt" in their community, whose wealth is estimated at more than 20,000,000 Egyptian pounds. "There is a feeling of humiliation and being completely under the mercy of the radical Muslims," said Rami Khashfa of the Alexandria Maspero Youth Union "they are terrorized and are scared of the future. Copts in the neighboring villages are also scared." He said that Copts in the village are thinking of moving elsewhere. Speaking on US-based Christian TV channel Al-Karma, Magdy Khalil, head of the Middle East Freedom Forum, said that reconciliation meetings made up of Salafis and members of the Muslim Brotherhood, and arranged by security officials are illegal and forced eviction is one of the crimes under international law. "Who gave them the right to form a committee headed by a Salafi to sell Christian property? This is thuggery and blatant targeting of Copts." Khalil called on the Coptic Melli Council, which is the civilian body that represents Copts in the Egyptian State, to protest this agreement and ask for the return of the Copts to their homes. "If we accept it, this will open the door for an avalanche of forced evictions." He believes that radical Muslim have a bigger plan they hope to achieve by terrorizing the Copts, namely displacing and dispersing them from places with high Coptic population density, taking their property and weakening them economically. Ihab Aziz, like many others, believes that "Coptic capital" is targeted everywhere in Egypt. He said that members of the Egyptian parliament have been made aware of the El-Ameriya forced displacement, and the issue will be brought before parliament shortly.